What do you think of when you hear the term “9-11”? September 11. A date. Does it remind you of the attacks on New York’s World Trade Center, or the attack on the Pentagon, or the attack that was frustrated by passengers in Pennsylvania? Will a local Chicago school be marking the date by honoring "first responders"? 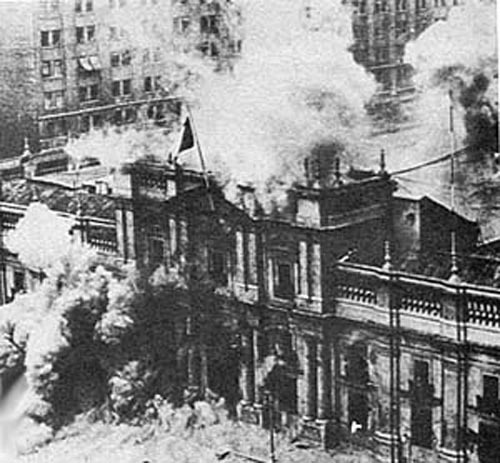 On September 11, 1973, the Presidential Palace in Santiago Chile was bombed by the Chilean Air Force as part of the military coup d-etat that overthrew the elected government of President Salvador Allende. Organized in cooperation with American corporations (including Anaconda Copper and IT&T), the coup leaders, including General Augusto Pinochet (who would become dictator for 17 years) rounded up as many popular, trade union, community and student leaders as they could on the day of the coup and in the following days. Many of those were rounded up based on lists provided to the CIA and Pinochet's people by American unionists working for the CIA-funded American Institute for Free Labor Development (AIFLD). Hence, the blood of those who were tortured and murdered by the Pinochet people is on the hands of several American unions, most notably the American Federation of Teachers (AFT), whose Cold Warrior policies included working with AIFLD and other CIA fronts in the "international free labor movement. "It reminds me of all of these things but, more importantly, it reminds me of the FIRST 9-11, September 11, 1973, when the US helped overthrow the democratically-elected government of Salvador Allende in Chile. This wasn’t the first time in the post-World War II period that the US Government had helped overthrow a democratically-elected government. The US had done that in Iran in 1953, Guatemala in 1954, and Brazil in 1964. Plus, the U.S. government and corporatioins had supported dictators in a number of countries in the Caribbean, "Latin" America, Africa and Asia by that time. But September 11, 1973 was the first one that many of us who came to political consciousness in the “1960s” experienced it directly. Nobody denied the basic facts, or denies them today. 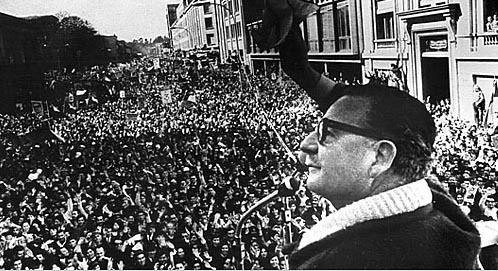 Salvador Allende was an experienced Chilean politician who worked to gain the presidency. He won in 1970 with a plurality, and according to the Chilean Constitution was put into power legally. He was no radical; politically, he could be described as a social democrat, someone who sought some form of “socialism” but wanted to achieve it through electoral politics. 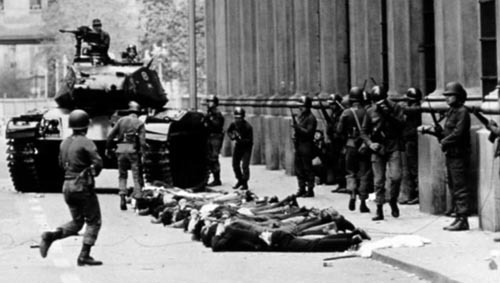 Protests against the September 11, 1973 coup d'etat in Chile were quickly and brutally suppressed, and leaders and members of protests were rounded up by the military and police and then tortured and murdered at various locations in the country, including the infamous soccer stadium in Santiago. Allende realized that Chile was being raped of its natural resources — most importantly, copper — by US multinational corporations such as Anaconda. These multinationals had invested something like $800,000 in Chile, yet had taken over $5 billion out—and climbing. Allende realized that he could not successfully address the development problems in Chile — the poverty, the lack of nutrition for children, the slums — without nationalizing the facilities owner by US corporations, and using the profits from the copper operations for the good of the Chilean people. When he nationalized the US investments, he put himself on a collision course with the US Empire. Nixon and Kissinger did all they could to cut off development aid to Chile, both by the US government, but also by multilateral development institutes like the Interamerican Development Bank and the World Bank, while increasing aid and training to the Chilean military. Thousands “disappeared,” some after being confined in the National Stadium, or were killed while in the stadium. (Two Americans—Frank Teruggi and Charles Horman—were among those killed. The movie “Missing,” starring Jack Lemon, was an account of Horman’s father’s efforts to find out the fate of his son. Teruggi had done some organizing in Chicago earlier). The military took over after the coup, and later General Augusto Pinochet became the “main man.” Soon, it was time for the infamous "Chicago Boys." Pinochet invited a group of economists trained at the University of Chicago to advise on reviving the economy. Nicknamed "The Chicago Boys" (since many of them were young proteges of economist Milton Friedman), they implemented a "free market" and privatization program that would later go by the name of neo-liberal economics. The objective was to remove any government regulation of the economy that had been implemented by the Allende administration. The only value they projected positively was profit-making, the so-called "free market" -- if something made a profit, it was good—if not, it was bad. And it didn’t matter at what cost to the people the profits came. Trade unions and any pro-workers organizations were disbanded, and their leaders tortured and killed. The world famous Chilean singer Victor Jara was among the thousands of activists tortured and murdered by the CIA-backed coup d'etat. According to the reports of witnesses, the torturers cut off Jara's finger and then taunted him to play his famous songs against oppression while his hands bled and he suffered in extreme pain. A lawsuit filed in the United States this month (September 2013) asks that one of those torturers, now living in the USA, be brought to justice in the United States 40 years after his crimes.Social programs that fed the poor, or educated the masses, those that provided services to the mentally disabled, or supported working class families were terminated by Pinochet and the Chicago Boys at first opportunity. Charter schools proliferated, long before they were pushed in the USA. Social Security was largely privatized. The list could go on, and anyone interested can read much about it easily now that the Internet is available, as it was not in the 1970s. Pinochet also smashed anyone or any organization that challenged the coup or his rule. His rule was all-but-absolute, and was not overturned until the early 1990s. Since then, there has been a struggle to find and publish the truth about what was done during those days, as two recent New York Times articles illuminated this month (see below). Although we’ve yet to have the violence of the Pinochet dictatorship in the United States, our leaders — beginning particularly with Ronald Reagan and continuing today under Barack Obama — have been carrying out neo-liberal economic policies since the early 1980s and, just like in Chile, they have been a disaster for most of the people. The United States is the most economically unequal of all of the so-called “developed” countries — in fact, we are more unequal that some of the poorest countries in the world, such as Bangladesh, Uganda and Vietnam. We have the highest imprisonment rate in the world. The contrasts between the "one percent" (start at the Gold Coast) and the lives of the "99 percent" (then drive to Englewood and continue south and east from there) is as stark in Chicago as anywhere. And in 2013, another group of Chicago Boys, on orders from Rahm Emanuel, closed the largest number of public schools in the history of the USA. I could go on and on. When profitability is the only acceptable value, it empowers the wealthy and those who operate for them, while devastating the social reality we call “society.” At the same time, the US Government has put massive amounts of money into building its war machine; over $10 trillion dollars, conservatively, between 1981 and 2010. We spend more money each year than our 14 closest military competitors combined! This is money than cannot be put into education, health care, rebuilding our infrastructure, addressing global climate change, or taking care of our people. We can try to dominate the world, or we can try to take care of our people, but we cannot do both. This brings us to Chicago and Mayor Rahm Emanuel. Emanuel is on a “mission from god,” to destroy the Chicago Public Schools, and replace them with charter schools. Besides any ideological animosity to public education that might come from this graduate of one of the most expensive private colleges in the country, Sarah Lawrence — and his kids are in the private, and very expensive, University of Chicago Lab School — Emanuel wants to turn public education into a “for profit” venture. Key to doing this is to break the Chicago Teachers Union. Now, Emanuel will complain about the high cost of a unionized work force — and they do get paid more than non-union teachers, for sure — but the real issue is power. Emanuel wants no one to challenge his plans, and certainly wants no one to have the power to stop them and tell the public that the Emperor is naked, which the CTU did in the 2012 teachers’ strike. He cares not for the students, the parents, the teachers, or Chicago: it’s his way or the highway. Ultimately, he has this delusion of becoming the President of the United States, and he’ll throw anyone necessary under the bus to get his shot. I’m sure, in his private moments, he wishes he could use the Pinochet option. Think I’m exaggerating? Guess who closed down much of the South Loop in May 2012, and mobilized over 3,000 police—including state troopers—to defend a meeting of the North Atlantic Treaty Organization (NATO), the greatest war-killing machine in the history? (Wait until you see the new movie, “Four Days in Chicago,” which can be found at http://www.fourdaysinchicago.com. )”I didn’t get the Mayor’s last name, but it sure sounded like Pinochet. NEW YORK TIMES SEPTEMBER 9, 2013 ARTICLE BELOW HERE: Chile Recalls Coup With Flurry of Events and New Openness. By PASCALE BONNEFOY. Published: September 8, 2013 (Times Website). National edition in print September 9, 2013. Although Henry Kissinger helped organize the coup d'etat that overthrew the elected government of Chile in September 1973, he continued to be honored for decades afterwards. During the past ten years, however, he has become more and more known for his war crimes and crimes against humanity, and could be subjected to arrest in a number of countries. Richard Nixon and Kissinger were central to the CIA-backed coup against the democratically elected government of Chile on September 11, 1973.SANTIAGO, Chile — Sunday dawned with the dark shadow of a Hawker Hunter jet painted on a Santiago street, pointing toward the presidential palace. Hours later, tens of thousands of Chileans marched through the capital to commemorate when 40 years ago Chilean Air Force jets bombed the palace, helping to overthrow an elected socialist government and obliterate what had been one of South America’s healthiest democracies. The resulting military dictatorship of Gen. Augusto Pinochet, who ruled for 17 years, suspended political and civil rights; censored the press; and imprisoned, tortured, exiled, abducted or killed tens of thousands of its opponents. Though there have been official reports about the human rights abuses since then, and some military officers have been prosecuted, many Chileans say the country has not yet fully come to grips with what happened. 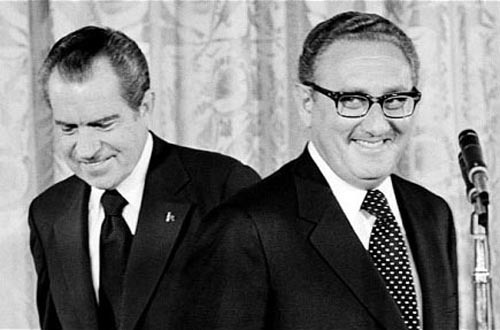 After his early sponsor Richard Nixon left the presidency in disgrace, Henry Kissinger continued his relationships with the reactionary leaders of the USA. 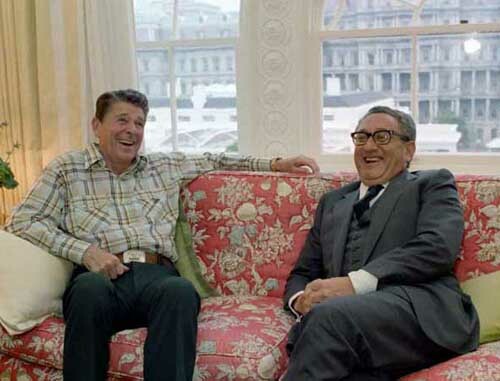 During the 1980s, Kissinger supported the illegal activities of the administration of President Ronald Reagan, including "Iran Contra". The date of the coup, Sept. 11, 1973, is commemorated annually, but the weeks leading up to the anniversary this year were marked with an avalanche of related events that some Chileans found emotionally exhausting. There have been conferences, book launches, plays, photo exhibits, documentaries and performances. Over the weekend, human rights activists hung banners on several of the capital’s bridges over the Mapocho River, where dozens of victims’ bodies were dumped in the first few months after the coup, and have painted murals along the river bank. One of the banners reads, “Where are the disappeared?” The police took the banners down Sunday morning. Perhaps most striking is the vastly increased attention the mainstream news media have given the subject this year, with few exceptions. Television channels have dug up and broadcast previously unseen film footage from the years of the ousted socialist president, Salvador Allende; the coup; and the repression that followed. Special programs about dictatorship, dramatic series based on real events and extensive interviews have broken through previous self-imposed limits on what television channels would show or say. In late August, a televised confrontation between a man who was orphaned at 2 when his parents were killed in northern Chile shortly after the coup and the military officer, now retired, who delivered him to a convent afterward led to the resignation of the officer from his current post as director of the country’s Electoral Service. The story had been told before, but the politically charged atmosphere and the fact that it was televised prompted his resignation. Even so, the conservative parties now governing Chile, whose leaders flourished during the Pinochet years, remain reluctant to call his rule a dictatorship, and objected when the new municipal council of the Providencia district of Santiago voted that a street the Pinochet government had renamed 11 de Septiembre should be restored to its original name, Nueva Providencia. Most notably, the National Association of Judges apologized for the failure by the courts, and particularly the Supreme Court, to protect victims of abuse. Of the thousands of petitions filed with the courts asking that the government be ordered to release or account for abducted opponents of the Pinochet government, all but one were rejected. Mr. Piñera called on anyone with information on what happened to the disappeared to come forward. But the army insists it has no more information to provide, and judges who investigate human rights violations from the Pinochet era usually run into a wall when they try to obtain information from the military. Henry Kissinger's longevity has enabled him to continue his career as a well paid reactionary consultant into the 21st Century. As early as the 1970s, his supposed sexiness was widely noted among the more shallow pundits in the USA. 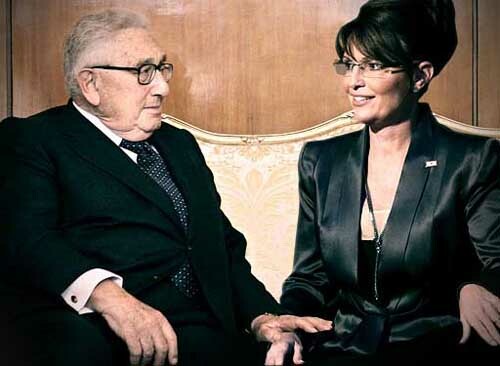 "Power is the ultimate aphrodisiac" is one quote attributed to Kissinger. “Many people thought that time would quiet things down, but it’s been the other way around,” said Pamela Pereira, a human rights lawyer. “As more time goes by, the truth of what happened and the full dimension of the violence becomes even clearer, and the country’s institutions are forced to assume their responsibility.” Ms. Pereira’s father disappeared in 1973, when she was 20; his remains were identified in 2010. SANTIAGO, Chile — A former Chilean Army officer charged with murdering Víctor Jara, a popular folk singer, shortly after the 1973 military coup has been sued in a Florida court under federal laws allowing legal action against human rights violators living in the United States. 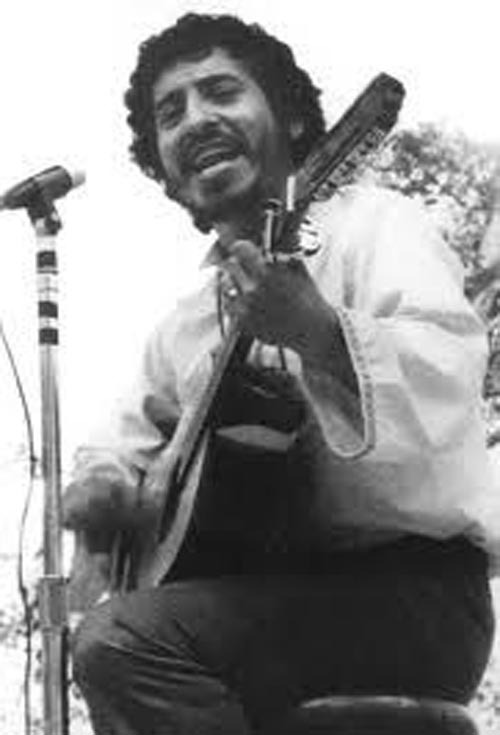 Mr. Jara, then 40, was a member of the Communist Party and an accomplished theater director and songwriter whose songs of poverty and injustice remain vastly popular. He was arrested with hundreds of students and employees at the Santiago Technical University, where he was a professor, a day after the Sept. 11 coup that ushered in 17 years of the dictatorship of Augusto Pinochet. The detainees were taken to Chile Stadium, used to hold thousands of prisoners. There, Mr. Jara was singled out with a few others, beaten, tortured and shot. His body, with 44 bullet wounds, was found dumped outside a cemetery with four other victims. The arena was later renamed Víctor Jara Stadium. The lawsuit against the former officer accused of his murder, Pedro Pablo Barrientos, comes as Chileans take part in a number of cathartic, emotionally charged events leading up to the 40th anniversary of the coup. It was filed Wednesday by the San Francisco-based Center for Justice and Accountability in a Jacksonville district court on behalf of Mr. Jara’s widow and daughters under the Alien Tort Statute and the Torture Victim Protection Act of 1991. Mr. Barrientos, 64, moved to the United States in 1989 and became an American citizen. He lives in Deltona, Fla., southwest of Daytona Beach. Last December, a Chilean judge charged Mr. Barrientos and another officer, Hugo Sánchez, with committing the murder. Six other officers were charged as accomplices. “Although ideally justice should be achieved in the home country, international justice efforts are at the service of the victims and by pursuing them, we can support and invigorate justice at home,” said Almudena Bernabeu, a lawyer for the center. Mr. Barrientos was found in Deltona last year by a Chilean television crew and denied having ever been in the stadium. But a dozen soldiers from his regiment have testified that he was in charge of the companies sent there. One of the soldiers, José Paredes, said in legal testimony that he had witnessed Mr. Barrientos and other officers beat and torture Mr. Jara and other prisoners. “After that, Lieutenant Barrientos decided to play Russian roulette, so he took out his gun, approached Víctor Jara, who was standing with his hands handcuffed behind his back, spun the cylinder, put it against the back of his neck and fired,” Mr. Paredes stated. The gun went off and Mr. Jara “fell to the ground,” he added. The other officers fired as well, he said. Although the Chilean Supreme Court authorized the judge’s request to extradite Mr. Barrientos from the United States in January, the Chilean government has not sent the extradition request to American officials. The 543-page legal file is still being translated, according to the Foreign Ministry. Since she first filed a criminal lawsuit in Santiago in 1978, the case has been handled by half a dozen judges; it was closed and later reopened; Mr. Jara’s remains were exhumed for forensic analysis and reburied in 2009; and the details about his killing have been coaxed out of witnesses drop by drop. “All of the information that has been dug out about the officers who were in the stadium has been discovered without the help of the army,” she said. The legal action against Mr. Barrientos seeks damages for torture; extrajudicial killing; cruel, inhuman and degrading treatment; crimes against humanity; and arbitrary detention. The plaintiffs are requesting trial by jury. The ultimate goal, Ms. Jara said, was not monetary compensation, but to use the only available legal tool in the United States to hold Mr. Barrientos accountable. Mr. Barrientos could not be reached for comment.